If you’re looking for a hefty amount of power from a crate engine for your next swap, Edelbrock has the solution for you! Their monstrous 540 cubic inch crate engine is a great power plant for your next high performance build. It comes ready for you to drop into your engine bay. This Chevy 540ci engine makes 650 horsepower and 640 lbs-ft of torque on pump gas. It includes a Victor Jr. intake manifold and E-CNC rectangular ported heads. Learn more about this huge displacement engine in the official release below. The Edelbrock 540 c.i.d. 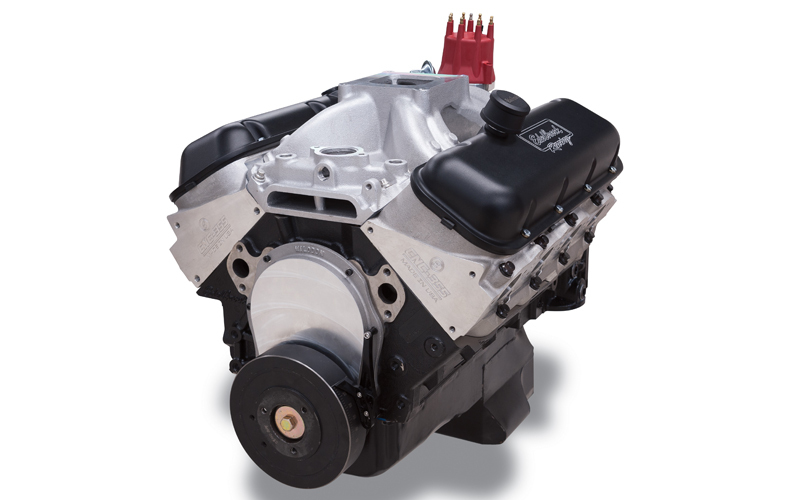 crate engine is a great powerplant for any high performance build. It features a top end package that includes a Victor Jr. intake manifold and E-CNC rectangular port cylinder heads that are 100% fully CNC ported for improved air flow. These heads also have stock exhaust port locations for use with off-the-shelf headers. When combined with our Rollin’ Thunder hydraulic roller camshaft, this combination delivers over 650 horsepower and 640 ft-lbs of torque on pump gas.